I mentioned last week how important it was for Robert Griffin III to legitimately win the Cleveland Browns’ quarterback competition. He’s been on the inside track of said battle since he joined the team, so his being named the starter is almost a certainty regardless of how good he looks in training camp. Still, there were many reasons why Griffin truly had to earn the job Cleveland’s coaches are kinda-sorta gifting to him. So, it’s definitely good to see Griffin has actually looked pretty impressive in his first camp with the Browns. No, he hasn’t played like the QB we saw take the league by storm in 2012. At the same time, he also hasn’t looked like the physically and emotionally shattered player we watched during his remaining years with the Washington Redskins. Knowing this, it’s important for everyone to head into the upcoming season with appropriately set expectations for Griffin. Barring an injury or outright ghastly preseason performances, he’s going to be Cleveland’s starter. Some think he’ll continue the downward spiral which is his on-field performance for the past few years. Others think it’s possible for him to re-discover the electric abilities he showed off in his rookie season. The truth is we should probably look somewhere in between those two projections. 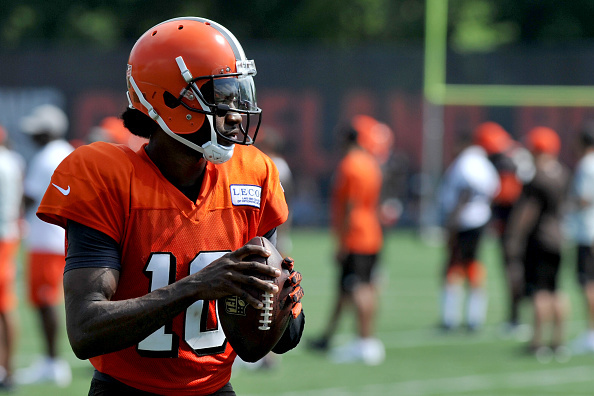 From everything we’ve heard coming from Browns camp, Griffin has definitely looked like a starting quarterback. He’s displayed impressive arm-strength, while also being praised for improved accuracy. Additionally, he seems to be embracing Hue Jackson‘s request that he become a true locker room leader. It’d be easy for Browns fans to hear this and start preparing comebacks to throw at everyone who laughed when the team signed Griffin this past winter. That said, while he’s impressed in some areas of his game, there are others still in need of work. For one, he’s still having trouble going through his progressions. Griffin is showing a tendency to pick one wideout and focus only on him. While this is great when said receiver is open, it’s another story if he’s running through triple coverage. Additionally, Griffin is still adapting to the requirements of being a pocket passer. This has always been a part of the job he’s struggled with, and though he took time in the offseason to work on his pocket mechanics, he’s not quite there yet. Obviously, anyone who mocked the Browns’ signing of Griffin can point to this as reason why he’s doomed to fail in Cleveland. However, said cynics, too, might be off-base. For one, it sure seems like the Browns have adjusted accordingly when it comes to working with Griffin’s progression problems. Cleveland is setting up schemes designed to get receivers open later in their routes than usual. While this won’t automatically make Griffin an All-Pro quarterback, it’ll certainly help him when he’s locked on one wideout more than others. Additionally, the Browns’ insistence on keeping Griffin in the pocket will hopefully keep him upright longer. Sure, Washington struggled tried to keep him behind the line for two seasons. Still, Cleveland coach Hue Jackson has been all over Griffin, hammering home the need to play smarter while also making sure he throws the ball away when things look ugly. In considering all of this, you can see where those expecting Griffin to become a walking highlight reel and those who think he’ll be an outright disaster are likely all going to be wrong. Injuries and an adjusted playing style probably eliminate the possibility of him looking like the 2012 Rookie of the Year anytime soon. Likewise, the Browns seem to be tailoring their offense to work around his deficiencies as much as possible. Knowing this, just what can we expect from Griffin this year? Honestly, I think he has the potential to become a reliable quarterback for Cleveland. Jackson wouldn’t have made Griffin go through hoops well before the Browns signed him had he not truly believed this himself. That Cleveland did as much vetting as possible before committing to him means both sides feel confident this marriage can work. That said, there’s a difference between “reliable” and “top-tier.” It’s very difficult for me to believe Griffin is on the verge of a breakthrough season. At the same time, Browns fans haven’t seen a reliable quarterback in…you know what, I’m not going to say how long. It’ll only make this more depressing. The point is that if Griffin can do just well enough to keep Cleveland in games, mixing in a spectacular play or two while he’s at it, that’s much more than anyone would’ve expected from him when he signed. It certainly seems as though the Browns are designing their offense around him being able to do just that. So, if we’re looking for the safest guess when it comes to setting expectations for Griffin, I’d say we’d have to go somewhere between dependable and above-average. Obviously that projection isn’t going to excite anybody. Still, when’s the last time Browns fans saw a quarterback who could be accurately described by those terms?